With the ramen craze in full swing, I decided it was time to check out one of the new hotspots for myself. After much anticipation, Nami Ramen finally opened its doors at the corner of Maryland and Central Ave. in Clayton. This completely renovated space is an order at the counter, food is brought to your table concept. It features an open kitchen with counter seating as well as a long community-style table in the center of the restaurant. Before talking about the menu, I want to point out that the ramen of today is not your cheap, Styrofoam cup of noodles that you heat up in the microwave. We are talking a large bowl of homemade broth, a substantial serving of noodles, protein, and fresh vegetables. The menu at Nami Ramen features ten ramen options, most of which are pork based. However, there are seafood, veggie, and chicken options too. We started with the tempura shrimp bao. This appetizer features shrimp tempura, cucumbers, green onion, and chipotle mayo inside a fluffy steamed bun. The greens created a nice crunch against the soft bun and a really good contrast to the fried shrimp. While tasty, I found my entrée so large that an appetizer almost wasn’t necessary. I chose the veggie ramen for my entrée. My large bowl of broth was served with noodles, roasted tomatoes, sprouts, mushrooms, edamame, brussel sprouts, seaweed, and green onion. I loved the rich flavor of the broth although my husband pointed out that it seemed a bit oilier than others we’ve had. My only complaint about the dish itself is that the brussel sprouts were served whole and rock hard making them a little difficult to eat. While a little pricier than your typical order at the counter restaurant, it seemed right in line with other ramen restaurants in the area. Portions were so large that I was even able to get a second meal out of it. Just be warned, until you master the art of eating Ramen, be prepared for a few slirps and splatters. When you walk into Fountain on Locust, you almost don’t know where to focus your attention. One part of you is drawn towards the bar in the center of the restaurant where amazing ice cream treats are being prepared while the other part of you just can’t stop staring at the designs on the walls. This old auto showroom turned restaurant has a vibe all its own with floor to ceiling art deco paintings, black and white checkered tile, and retro booths lining the edges of the restaurant. While it is hard to place this restaurant in one particular category, one thing is for sure, you will not walk out the door hungry. The large menu is filled with pages of ice cream martinis, champagne floats, retro cocktails, house-made sodas, and ice cream desserts. If that weren’t enough, I should mention that they also have a large selection of food to accompany your sweet treat. My meal started with a black cherry egg cream. This interesting drink is made with one of 10 flavored syrups, light cream, and seltzer and tasted most comparable to a melted ice cream float. 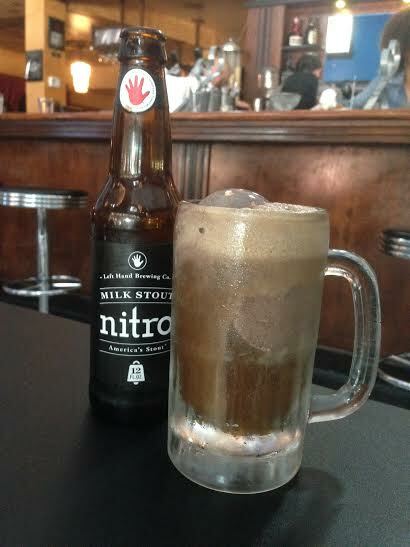 My husband went for the real deal and chose a Nitro Milk Stout float made with Left Hand Brewery stout and chocolate ice cream. The ice cream at Fountain on Locust is so unique because it comes from the only dairy in the country that ages their ice cream for extra flavor. Having been told that they are known for their soups, we decided to share a vegetable soup which was filled with garbanzo beans, butternut squash, and spinach and seasoned with cinnamon and nutmeg. This hearty but light soup was the best that I have had in a LONG time and would be perfect for a cool fall day. Since it was too difficult to pick one sandwich, we decided to split two. First up was the Signature Mixed Salad Sandwich which was unlike any other sandwich I have ever had. It is basically a chopped salad with pesto dressing served on a toasted baguette with melted cheese. While the salad on its own is just okay, the sandwich as a whole is amazing! Next up, was the Royal Grille. This adult grilled cheese is made with melted mozzarella and white cheddar cheeses with slices of apple on whole grain wheat bread. While both sandwiches were good, the Mixed Salad Sandwich was definitely the favorite. Each dish came with a side and we chose the spicy carrots and brussels kale cup (each can be ordered as an entrée). The spicy carrots are marinated and seasoned with crushed red pepper giving them a little kick. The kale cup is made with shredded brussel sprouts, kale, broccoli, and cabbage and mixed with orange slices, sunflower seeds, and poppy-seed dressing. Don’t worry, this sounds much healthier than it tastes! The menu is incredibly dietary-restriction friendly with lots of vegetarian options in addition to gluten-free, lactose-free, and egg-free choices. The restaurant is perfect for kids or for a drink out with friends. Prices are really reasonable with entrees averaging $8-$10. Sadly I was too full for dessert, but now I definitely have even more of a reason to come back! What comes to mind when you think of when you think of a diner? Greasy, fast, retro, late-night? I was expecting all of this out of the Central West End’s newest restaurant, Kingside Diner, but I was left a little disappointed. 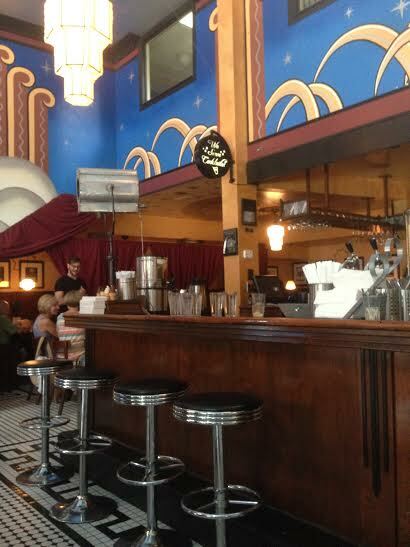 The theme of the restaurant is supposed to play off of its neighbor, the St. Louis Chess Club. However, aside from the name, a few catchy menu items, and a couple of TVs on the chess channel, the theme seems to stop there. Rather, the inside feels more like a modern, casual restaurant instead of a bustling diner. Our experience was off to a bad start when the not-so-friendly hostess took our name and told us that it would be 20 minutes until we would be seated. This would normally not be a a big deal except there were multiple tables inside and out that were unoccupied. We were told that there were just not enough people to wait on all of the tables and that more servers should be arriving soon. Knowing it was a Sunday morning on Father’s day, you would expect that the restaurant would be fully up and running. Once we were seated, we looked over the large menu of breakfast items, sandwiches, burgers, chili, salads, and daily specials. We decided to start off by splitting the cheddar drop biscuits. I chose a burrito filled with eggs, spinach, tomatoes, red onion, and buttermilk basil which was served with a side of hash browns. My husband went for something a bit more unusual, Grandma Rosie’s rolled cabbage. This Eastern-European inspired dish consisted of beef stuffed cabbage and tomato sauce served over a bed of mashed potatoes. Our food took a full 30 minutes to arrive and I was brought someone else’s order. The mix-up was quickly corrected and we were finally able eat. Luckily the disorganized feel of the restaurant did not ruin the taste of the food. The buttermilk basil on my burrito was what made this dish stand out. The tortilla was warm and fresh, the eggs were well cooked, and the portion was just right. The hash browns were both crispy and greasy, just like I would expect at a diner. However, I didn’t love the cheddar biscuits as much as I expected. 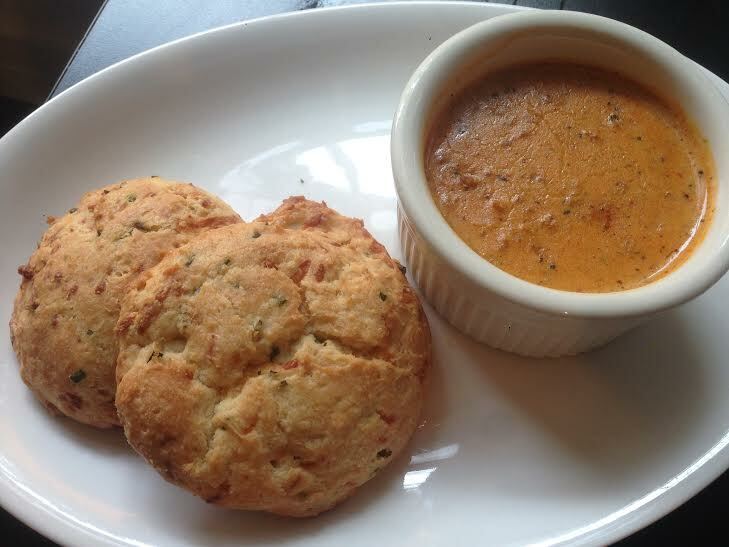 They were dense and dry but in their defense, I did not top mine with the creamy chorizo and sage gravy. My husband loved the gravy and put the left overs on his mashed potatoes. My husband also enjoyed his cabbage dish because it reminded him of something his grandmother would make. I did not grow up with anything close to this and it didn’t suit my taste quite as much. Luckily the best part of our meal was the food. The menu is well priced and the restaurant is family friendly (although I did overhear the hostess say that they ran out of highchairs). Although Kingside Diner has been open for a few months, the kinks in the service need to be worked out before I’ll be back. I came across Lona’s Lil Eats after receiving some spot-on restaurant advice from a friend. It took three attempts to actually dine at the restaurant due to their somewhat limited business hours but it was worth the wait! 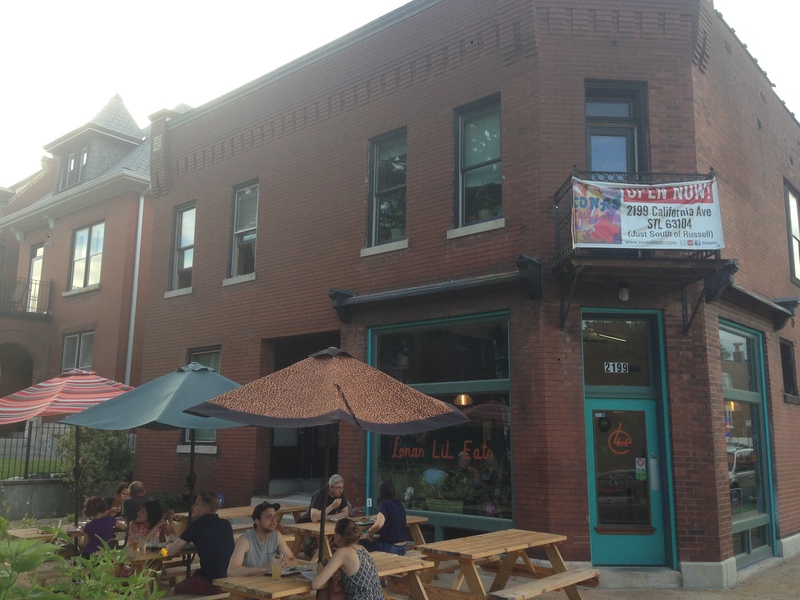 What started as a stand in Soulard Market, is now a brick-and-mortar restaurant located on an unassuming corner in the Fox Park neighborhood. Lona’s serves up what can be best described as Asian soul food, pulling flavors from her native home in the Yunnan province of Southern China. The restaurant is set up so that you order at the counter and food is delivered to your table. What is normally a less than personal restaurant format is exactly the opposite at Lona’s. Every employee was welcoming, friendly, and helpful. They even brought us a shot of spiked punch from the bar when they heard it was our first time at the restaurant. The star of the menu is the build-your-own rice paper wraps (think Asian version of Chipotle). You choose your protein (grilled chicken, pulled turkey, spicy tofu, grilled steak, or stir-fried shrimp), then your staple (whole-grain rice, jasmine rice, glass noodles, stir-fry glass noodles, or lettuce mix), and finish it off with of one of five sauce choices. Each wrap is served with your choice of a side dish. There are also salad options, suggested wrap combinations, and plates which allow you to try more than one protein. 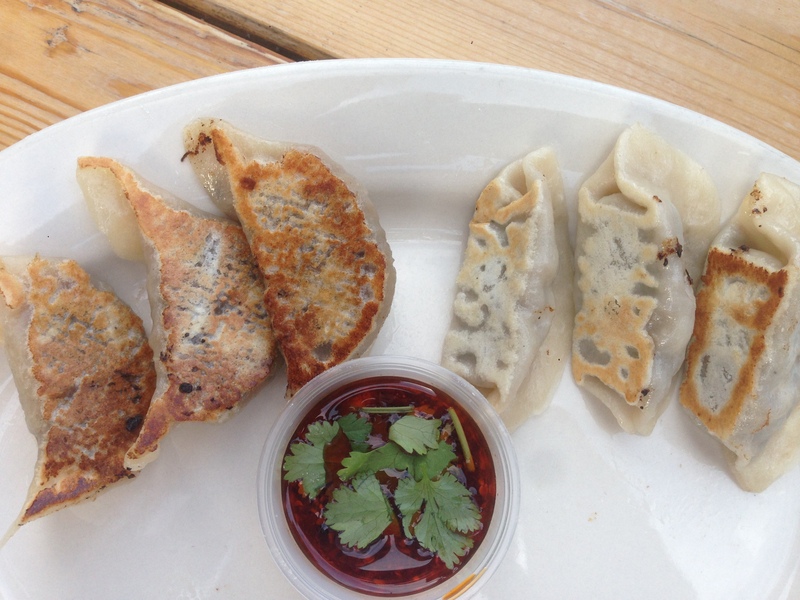 Be sure to do yourself a favor and start with an appetizer of dumplings, you won’t regret it. To start, my husband and I shared an order of dumplings, half mushroom and half mushroom and steak. They were full of flavor and served with a spicy sauce. Our entrees arrived on trays covered with white parchment paper. My wrap was stuffed with stir-fry shrimp, stir-fry glass noodles, and spicy sesame sauce. The wrap was quite large and held together surprisingly well. While I loved the bold flavors, I was left regretting all of my spicy fillers which were just too much for me. It was served with a side of spicy eggplant which luckily had a little less heat than I was expecting. It tasted like it had been marinating for days leaving it with great texture and flavor (my eggplant-hating husband even enjoyed this dish). My husband ordered a chicken wrap filled jasmine rice, lettuce mix, and Lona-Q sauce with a side of the village bamboo stew which was an unfamiliar tasting, yet interesting dish of pickled bamboo. We both agreed that portions of food are large and filling but leave you feeling healthy and light at the end of your meal. Overall, my experience at Lona’s was great. I loved the unique concept and have found nothing else like it in St. Louis. Just be sure to call and check the hours before heading there. Just when you’d started to tire of the froyo craze and you thought you’d have to revert back to regular old ice cream for a little change of pace, Ices Plain & Fancy rolled into town. This ice cream shop is like none other in St. Louis. Liquid nitrogen is used to make this frozen treat which creates an ice cream that has no ice crystals and is silky smooth in texture. 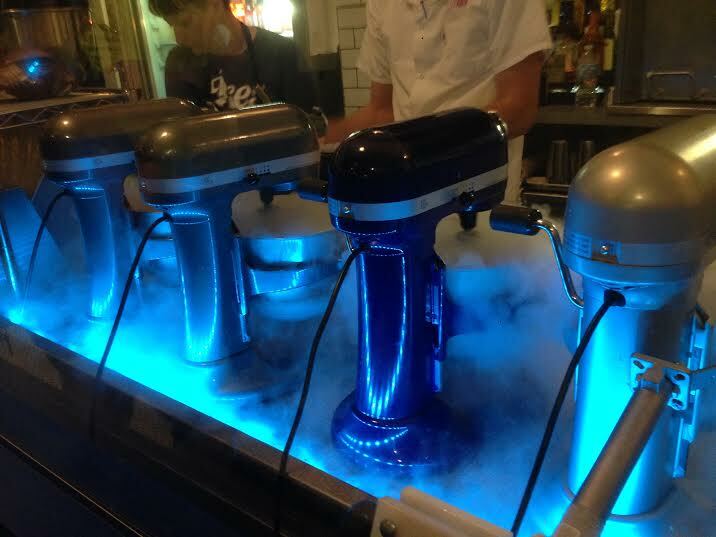 After choosing your flavor, the cream base is mixed in a Kitchen Aid mixer with your custom flavors and liquid nitrogen. While the process looks like a science experiment, the end result is delicious. The menu offers several traditional flavors as well as specials, boozy ices, a coconut milk base, and a seasonal sorbet. My trip to Ices was with a group of friends which actually turned into appetizers before our late dinner reservation. I had the chance to sample many things on the menu including Butter Pecan, Campfire S’mores, Salted Carmel Dulce de Leche, and Rocky Road, as well as two boozy ices, the Johnny Jump Up and Dark & Fancy. Although this seasonal selection will not be back until Fall, the Campfire S’mores was hands-down, the best ice cream I have ever tasted. The marshmallow ice cream base was infused with smoke flavor and topped with pieces of chocolate and graham cracker. To top it off, it appears that the ice cream is smoking when the liquid nitrogen escapes after removing the lid. One of my other favorites (and one that will be on the menu all summer) was the Salted Caramel Dulce de Leche. What makes this treat so amazing is the black salt that is sprinkled on top giving it a little texture and a hint of salty flavor. The boozy ices surprised me because they were served as a cup of ice cream instead of a shake. Instead of masking the taste of the alcohol, they are mixed with flavors that really highlight the liquor. 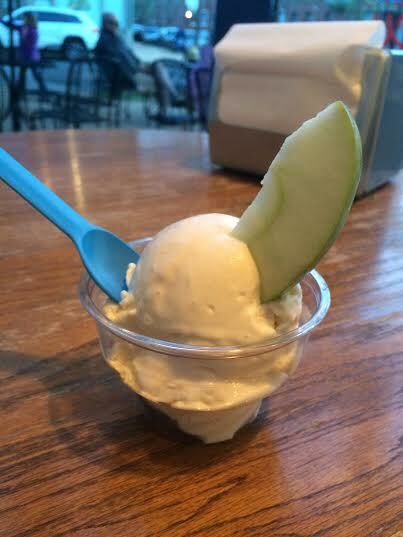 Ices Plain & Fancy is a great addition to the St. Louis ice cream scene and will keep kids and adults coming back for more. Just be sure to bring your patience because creative, custom orders take a little time to prepare and lines tend to go out the door. Open Wednesday thru Sunday, check the Ices Plain & Fancy website for times.